When you think of the Caribbean, your thoughts are probably of soft, white, sandy beaches, the Carribean Sea in every imaginable shade of turquoise and palm trees swaying gently in a cooling breeze. Yes, and you would be right. However, the islands of the Caribbean are far more diverse than that. Each island has its own distinct character, culture, geography, geology, history and highlights! Whether you want to relax under a palm tree on the beach, explore beautiful coral reefs, participate in active sports on land or in the sea, or discover tropical rainforests, mountains and volcanoes, the Caribbean can offer you all of that. Actually, on some Caribbean Islands you can do all of that in one day! 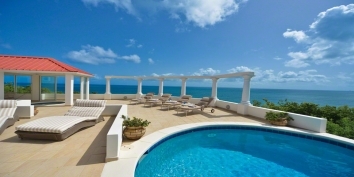 Find out more about Anguilla Villa Rentals By Owner. Find out more about Antigua Villa Rentals By Owner. Aruba is a perfect sun filled vacation island, out of the range of Caribbean hurricanes and with just 20 inches of annual rainfall. With a lengthy history, the approximately 69 square mile island has been attracting visitors since around 2500 BC. Colonisation began with Spanish missionaries who brought Christianity to the Indians of Aruba in the early 1500s, at the same time teaching them the Spanish language. In the 1600s the Dutch acquired control of the island, and then in 1986 Aruba was granted the status of an autonomous member of the Kingdom of the Netherlands. Find out more about Aruba Villa Rentals By Owner. With an archipelago consisting of more than 2,000 islands and cays, it’s impossible to accurately describe what awaits visitors to The Bahamas. If you like exploring, choosing The Bahamas will provide plenty of opportunities for island hopping and unique excursions such as swimming with pigs in the Exumas! The islands of The Bahamas are great for family vacations, with a large choice of family friendly accommodadtions, including villa rentals by owner. Find out more about Bahamas Villa Rentals By Owner. One of the larger islands of the Caribbean, Barbados is 166 square miles and has a current population of approximately 290,000. A relatively low lying coral island, the elevation rises slowly to create some rolling highlands in the centre of the island. Coral reefs ring the island creating terrific opportunities for snorkelling and SCUBA diving. The island is actually made up of two separate land-masses that merged aeons ago. This interesting geological anomaly has created interesting coral cave systems and underground lakes which provide a cache of pure fresh water, something usually in short supply within the Caribbean. Find out more about Barbados Villa Rentals By Owner. Find out more about Bonaire Villa Rentals By Owner. Find out more about British Virgin Islands (BVI) Villa Rentals By Owner. Find out more about Cayman Islands Villa Rentals By Owner. Find out more about Cuba Villa Rentals By Owner. Curacao is one of the ABC Islands along with Aruba and Bonaire in the Caribbean. Curacao is located north of the coast of Venezuela and is considered to be outside the Caribbean’s “hurricane zone.” This means that vacations to the island are very rarely disrupted by such tropical storms. Find out more about Curacao Villa Rentals By Owner. Find out more about Dominica Villa Rentals By Owner. The Dominican Republic is diverse in geography and in what it offers travellers. The capital city, Santo Domingo, is the heart of the island, but other smaller cities and towns make wonderful destinations. Cabarete on the North Coast, for example, is a kite-boarding paradise and has a bohemian vibe, while the cooler mountain retreats of Jarabacoa and Constanza offer white-water rafting, horseback riding and canyoning. The Dominican Republic truly offers a wide variety of holiday options, and will appeal to beach bums and adventure seekers alike. Additionally, history fans will have no shortage of opportunities to explore historical sites from those of the Taino to European and African. Find out more about Dominican Republic Villa Rentals By Owner. Find out more about Grenada Villa Rentals By Owner. Guadeloupe is a French Caribbean island located within the Leeward islands, in the Lesser Antilles. As an overseas region of France the island is part of the European Union and the Eurozone, so the currency of the island is the Euro, and the official language is French, though most locals also speak Creole. Beaches on Guadeloupe are beautiful and scenic. In addition to the lovely white sandy coastline, because the islands are volcanic, you will find some stunning brown and even black sand beaches. Find out more about Guadeloupe Villa Rentals By Owner. Find out more about Haiti Villa Rentals By Owner. Find out more about Jamaica Villa Rentals By Owner. Martinique is a Caribbean island and overseas department of France in the Caribbean Sea, north of St. Lucia and south of Dominica. The island is dominated by Mount Pelee, which on 8 May 1902 erupted and completely destroyed the city of Saint Pierre, killing 30,000 inhabitants. In the South of the island, there are many beautiful white sand beaches and in the North, rain forests and black sand beaches. The interior of the island is mountainous. Find out more about Martinique Villa Rentals By Owner. Montserrat is a British Overseas Territory and was once a popular get-away destination, but has been hit hard by the four elements. First in 1989 the wind and waves of hurricane Hugo swept through damaging 90% of the island’s infrastructure. Then in 1995 the Soufriere Hills volcano errupted forcing the long-term evacuation of 2/3 of the island’s population and closing the airports and seaports in June 1997. The capital of Plymouth was covered by 40 feet of ash and much of the southern part of the island is now uninhabitable. Government offices have been moved to Brades on the northwest coast of the island. Find out more about Montserrat Villa Rentals By Owner. 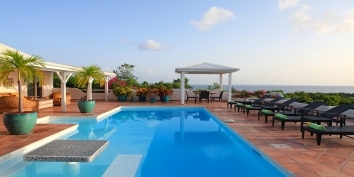 Find out more about Nevis and St. Kitts Villa Rentals By Owner. Find out more about Puerto Rico Villa Rentals By Owner. What’s in a name? Officially it’s Saint-Barthélemy, but is most often called simply St. Barts or even St. Barths and is a French Overseas Collectivity (until recently part of Guadeloupe) and is part of the European Union. St Barts has long been considered a playground of the rich and famous and is known for its beautiful pristine beaches, gourmet dining in chic restaurants and high-end designer shopping. 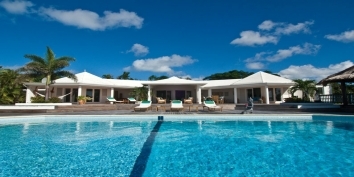 Find out more about St. Barts Villa Rentals By Owner. Find out more about St. Lucia Villa Rentals By Owner. Sint Maarten and Saint Martin occupy the same island in the the Eastern Caribbean. The Northern portion of the island is French and is known as Saint Martin; the Southern portion is Dutch and is known as Sint Maarten. The two parts remain separate entities under the umbrella of France and The Netherlands. On the Dutch side the currency is the Netherlands Antillean Guilder, while on the French side the Euro is the official currency, however, both nations widely accept US dollars. English is widely spoken and is an official language along with French and Dutch. Find out more about St. Maarten Villa Rentals By Owner. Saint Martin and Sint Maarten occupy the same island in the the Eastern Caribbean. The Northern portion of the island is French and is known as Saint Martin; the Southern portion is Dutch and is known as Sint Maarten. Saint Martin remains close cultural ties with its French roots, while the Dutch side embraces its Caribbean location. A visit to either Saint Martin or Sint Maarten means you can explore both nations and experience two very different holidays. Find out more about St. Martin Villa Rentals By Owner. Pirates of the Caribbean, I, II and III were all filmed in St. Vincent & Grenadines, as was the movie White Squall. Because of the diversity of the many islands within the chain, a visit to the country can be many holidays in one. Island hopping is a popular way to get more out of your Caribbean holiday, and visiting each of the inhabited islands is a fascinating way to learn about the culture and history of the region. Find out more about St. Vincent and the Grenadines Villa Rentals By Owner. Find out more about Trinidad and Tobago Villa Rentals By Owner. Though the Turks and Caicos Islands were orignally inhabited by Taino and Lycayan people, by the 1500s the indigenous people had disappeared. In the 1600s Bermudans began developing salt raking operations on the islands, ruins of large plantations can still be visited. In addition to spectacular white sand beaches and iridescent turquoise waters, the islands are famous for spectacular wall dives. With visibility topping 100 feet and a drop off the Caicos Bank which provides a sudden drop in water depth from around 50 feet to over 7000 feet, it’s no wonder divers visit from all over the world. Find out more about Turks and Caicos Villa Rentals By Owner. The US Virgin Islands (USVI) were originally inhabited by native Ciboney, Arawak, Taino and Carib people, the islands were claimed for Spain in 1493 and then passed through several hands before settling into the possession of Denmark in 1754. Denmark then sold the islands to the United States in 1916. Though there are numerous islands in the USVI, the main islands in the chain are Saint Croix, Saint Thomas and Saint John, along with tiny Water Island which was not purchased until 1944 when the Department of Defense via the federal government acquired it to protect the submarine base on Saint Thomas. At the time, they paid $10,000 but they sold the island back to the territorial government in 1996 for 25 million! Find out more about US Virgin Islands (USVI) Villa Rentals By Owner.